Chen Zheng Lei was born in Chenjiagou (Chen Village, 陳家溝), Wen County, Henan Province, China. In 1957, Chen Zheng Lei started the studying Taijiquan with his uncle Chen Zhao Pi, focusing not just in hands form and weapons but also Taiji theories very intently. In 1972, after Chen Zhao Pi death, Chen Zheng Lei continued the studies from his uncles, Chen Zhao Kui, another famous Taijiquan teacher who was the son of Chen Fake. Chen Zheng Lei specializes in the theories and skills of Taijiquan and push-hands, directly by his grandfather’s brother Chen Fake. He is recognized as one of four “Gautama Buddha|Buddha’s Warrior Attendants (”Si Jingang”),” the four outstanding exponents of the 19th generation in Chenjiagou. Those four Chen stylists including Chen Xiao Wang (陳小旺; Chen Fake’s direct grandson), Chen Zheng Lei (陈正雷; 1949–), Wang Xian (王西安) and Zhu Tian Cai (朱天才) traveled relentlessly giving global workshops and creating an international group of Chen-style T’ai Chi Ch’uan Chen-style practitioners. 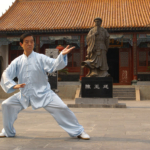 He is the creator of the List of T’ai Chi Ch’uan forms 18 Short Form of Lao Jia 18-Form/18-Form. 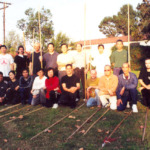 Chen Huixian Taijiquan Academy. In December 1995, Chen Zheng Lei was recognized as one of ”’Top Ten Martial Arts Masters of Present Day”’ living in China. Since 1998, the Chinese Wushu Association together with the National Sport Commission and the Chinese Wushu Research Institute has established a graduation system based on nine Duan levels (Dan (rank), Chen Zheng Lei achieved the ”’9th Duan Wei Grandmaster”’ (Jinlong—Jiu Duan: Gold Dragon) level in 2012, and he is one of the few holders of the highest rank of the Duan Wei system. Master Chen Zheng Lei has taught Shifu Marquez since 2008 having workshops around the Shaolin Temple teaching Chenjiagou Village Style. that was given only to closed door disciples which Shifu Marquez is not. 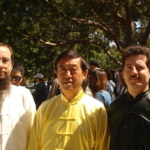 World Tai Chi & Qigong Day with Shifu Jonathan Savell – Grandmaster Chen Zheng Lei – Shifu Marquez.